Hidden Object Puzzle promotes Candy Store; a century ahead of it's time (no game app required). ..
A 6" x 3 1/2" stock puzzle card promoting a candy store. The tope portion with hidden objects appears to be a young girl in a somewhat surreal scene above mountains, a stream and dead streets. Captioned at top Hidden Away in this Curious Picture is a cat, a serpent, a lizard, a fly, a mule, an elephant, two birds, a rat, a boy, a dog, a fish and five other objects. Caption at base reads "To find the best Ice Cream call at CURTIS Candy Store. Reverse is blank.. 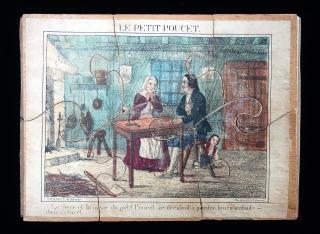 This six piece wooden puzzle with applied depicts a critical scene in the life of little Tom Thumb. The color lithograph is done by H. Jannin depicts the two parents at a table by a fire with sad expressions, as the caption reveals that the mother and father have decided to "loose" Tom in the forest. The mother has her hands clasped beneath her chin and the father with a hand over his heart to convey the difficult decision they made. All the while, Little Tom is eavesdropping right behind them. The puzzle is simple and is doable for a small child. Measures 6 3/4" x 5". .
A 7" x 4 1/2" x 2" litho on wooden box with sliding top. Includes 15 six-sided cubes to create the puzzles. Includes five (5) litho sheets illustrating the puzzle. Additionally, the box cover has the sixth puzzle. Five of the six are images of children either being trampled by farm animals or children with weapons, as though perhaps pretend "war"... Box wear; minor wear on cubes. .